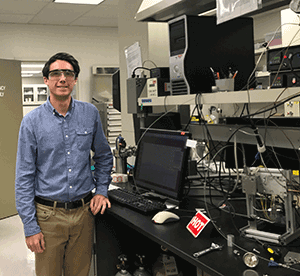 While a SULI student at PNNL, Jamey Bower translated 20 weeks of research on chemical material synthesis into a journal article with an 8.1 impact factor. Photo courtesy of the DOE Office of Science SULI program. If asked “What did you do on your summer vacation,” university student Jamey Bower has an impressive answer. He parlayed two summers of chemistry research at PNNL into a lead author role in a peer-reviewed journal article in Applied Materials and Interfaces. Bower came to PNNL under the U.S. Department of Energy program called Science Undergraduate Laboratory Internships, or SULI. DOE’s Office of Science funds this multi-week research internship for undergraduates in science, math, engineering, and technology and science policy. Bower worked at PNNL for a total of 20 weeks over two summers under the guidance of geochemist Todd Schaef and other mentors. When Bower left PNNL to complete his undergraduate degree in 2017, it was with a draft journal article manuscript in hand. The journal published it in April 2018. “In the short time frame of two summers, it’s extremely rare for a student to complete a body of research that leads to his first-ever manuscript being accepted in such a prestigious journal,” Schaef said. Applied Materials and Interfaces, published by the American Chemical Society, has an impact factor of 8.1. This is especially noteworthy, Schaef said, because geochemistry articles typically appear in journals with an impact factor of 4 or 5. He attributes that exceptional accomplishment to Bower’s dedication and commitment, as well as the team-mentoring approach where PNNL colleagues advised and helped Bower throughout his journey. This included mentors and collaborators from PNNL’s Energy and Environment Directorate and Physical and Computational Sciences Directorate. Bower, pursuing chemistry and Spanish degrees at a South Carolina college, started his research with PNNL scientist Chris Thompson in 2016, exploring the effect of methane adsorption in shales. When Bower expressed a particular interest in material synthesis, Schaef pulled in chemist Radha Motkuri to strategize an additional scope of work: developing novel materials that can be used to separate gas streams. This is important for separating out carbon dioxide from flue gas emissions, so that it can be captured rather than being released into the environment. DOE’s Office of Fossil Energy funded the research. Over two summers, Jamey and his colleagues worked through numerous experiments, ultimately showing that potassium-loaded zeolite material, when compared with other materials, was the best at adsorbing carbon dioxide under industrial conditions. The location and quantity of cations in the pores of the material affected adsorption. This result is significant because it showed that previous equilibrium-based calculations used to evaluate traditional benchmark sorbent materials, though commonly accepted in the chemistry community, were inadequate to assess the adsorbent potential of zeolite for industrial applications. Bower’s dedication and hard work while at PNNL were exemplary. “His lab work was meticulous and precise, and he was skilled at analyzing the results to understand what was happening,” Motkuri said. With guidance from PNNL staff, Bower even worked in the laboratory on some weekends to make sure high-vacuum equipment was working properly, ready for him to take measurements on Monday. Bower also worked on the journal article daily, consulting with his seven co-authors. Even after starting graduate school at The Ohio State University, Bower continued to correspond with PNNL staff to refine the article through several iterations before submitting it to the journal in 2017. When he heard the good news that the article had been accepted, Bower wasted no time in contacting Schaef to explore the next steps in his career. While Bower pursues a graduate degree in chemistry, he and Schaef are looking into opportunities that could bring him back to PNNL to continue his research. Bower, Jamey K., et al. 2018. Dynamic Adsorption of CO2/N2 on Cation-Exchanged Chabazite SSZ-13: A Breakthrough Analysis. ACS Applied Materials & Interfaces 2018 10 (17), 14287-14291.